The iPhone Dev-Team has managed to jailbreak iPhone OS 4 Beta. 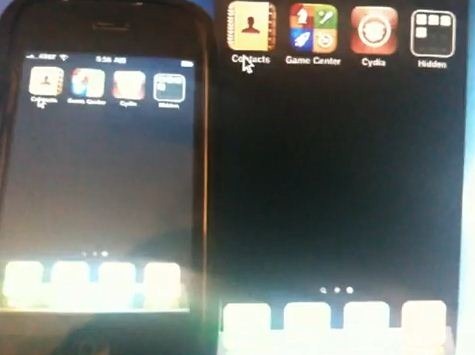 Musclenerd, a member of the infamous Dev-Team posted a video proof which showed off a VNC app running on a jailbroken iDevice in action. Video after the jump. And here is the video which shows it all in action. No ETA (Estimated Time of Arrival) on release. Apple yesterday unveiled iPhone OS 4 which brought more than 100 new features and over 1500 new APIs for both users and developers respectively. iPhone OS 4 is fully supported on iPhone 3GS and iPod touch 3G. iPhone 3G and iPod touch 2G will run most of the things except for multitasking. An iPad version of iPhone OS 4 is expected to be released this fall. In mean time, you can follow our complete jailbreaking guide for iPhone 3.1.3 firmware for iPhone 2G, 3G, 3GS and iPod touch 1G/2G using redsn0w 0.9.3, redsn0w 0.9.4, sn0wbreeze, PwnageTool 3.1.5. Unlocking can be done using ultrasn0w or blacksn0w. Is there any way to downgrade from 4.0? I don't have a developer account and my phone is pretty much bricked! ya how do i upgrade 2 4.0 on my iphone n jailbrake it…. IPHONE 4.1.2 IS ON MEGAPLOUDE I DOWNLOADED IT AND INSTALLED IT ON MY DEVICE AND IT WORKS 05.16.07 IS THE BASEBAND……… IF ANY BODY KNOW HOW I CAN POST THE DOWNLOAD IPSW I WILL POST IT…. where can i found my .ipsw file?